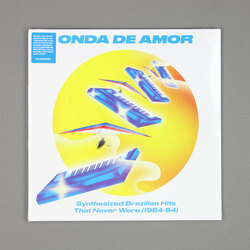 Various Artists - Onda de Amor: Synthesized Brazilian Hits That Never Were (1984-94). Vinyl LP, CD. Bleep. Top package from the folks at Soundway here as they explore the outer reaches of Brazil’s dusty record crates for sun-drenched, time-forgotten AOR, boogie, funk and soul. Forget all the tropes of last year’s Outro Tempo (equally amazing in its own right of course) and turn your attention to names like Andre Melo, Batista Junior and Grupo Controle Digitale. Sure, the last name there has been a heavy hitter in record circles for years now but many of these gems come from true obscurities that have luckily been given a second chance on the market. Probably the most perfect summer record we’ll ever stock.